One of the best things about birthdays are the treats. Children look forward to sharing a birthday treat with their friends at school, many of us love being treated to a special meal at a restaurant, and almost all of us indulge with a tasty dessert treat on our birthday. In fact, birthday cake sounds REALLY good right now! Our birthday celebration for author/illustrator Betsy Snyder is full of treats to share, including a memory of her favorite birthday treat, accompanied by a special recipe. In addition, there is an exciting book treat (a signed copy of her new book) for one lucky reader and those who "Tweet for the Treat" will increase their chances to win that prize! 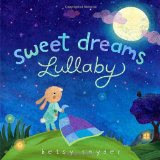 Betsy Snyder has published six books for children including the very gentle sleepy time book, Sweet Dreams Lullaby. According to her bio on Painted Words she has, "over ten years experience working in the juvenile market. She has worked as a staff artist at American Greetings, written and illustrated numerous children's books and developed products encompassing greeting cards, gift wrap, board games, stickers, puzzles, scrapbook kits, and much more." The beginning of her career can be dated back to when she was about five years old when "she intently scribbled on an old piece of cardboard with a bright orange marker. She titled her masterpiece 'The Invisible Lady with One Orange Leg' and dreamt of becoming a REAL artist someday." (from bio sent via email). Betsy describes her illustration technique as "digital collage" which is a "combination of digital and traditional methods. (PBJunkies). Her forthcoming book, I Haiku You, will be available on December 26, 2012. She said on her blog, "This book is very close to my heart and I hope it can make its way into yours too." 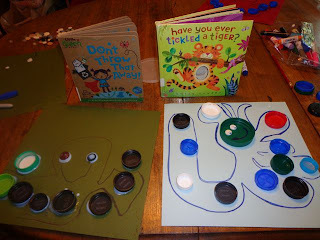 My children loved all of the books we read this week by Betsy Snyder including Tons of Trucks by Sue Fliess, Haiku Baby and Peanut Butter and Jellyfishes by Brian P. Cleary. It was hard to pick just one book to be our favorite. 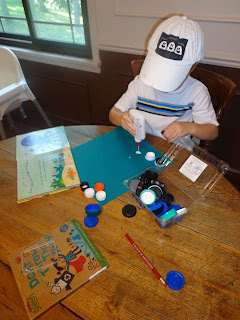 Actually, inspiration for our birthday celebration activity came from two of Betsy's books. The first book we read was Have You Ever Tickled a Tiger? by Betsy Snyder. This book includes six touchy-feely textures, fabulous illustrations, and a text that encourages a young reader to interact. The text on the last page asks, "Have you ever hugged an octopus? She has eight arms for great big hugs and suction cups to keep you snug!" For my children and I, we found the illustration of the octopus that accompanies this text to be very attractive and memorable. 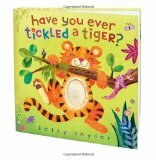 The morning after we read Have You Ever Tickled a Tiger? my boys and I read Don't Throw That Away! by Lara Bergen and Betsy Snyder. This lift-the-flap board book is made of 100% recycled materials and tells the reader to "Don't throw that away!" and instead "turn it into" something else. This book reminded me of the lids from soda bottles, milk jugs, and other containers that we have been collecting with hopes of reusing them for an art project. Then, I remembered the illustration of octopus and I knew exactly how we could use the lids. This is our Don't Throw That Away! drawer. 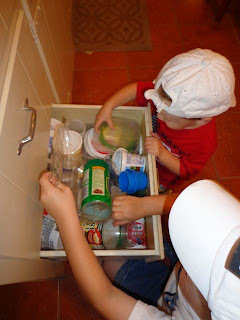 We save containers and lids of all shapes and sizes just in case we need them. My boys went through the drawer and gathered all the lids. 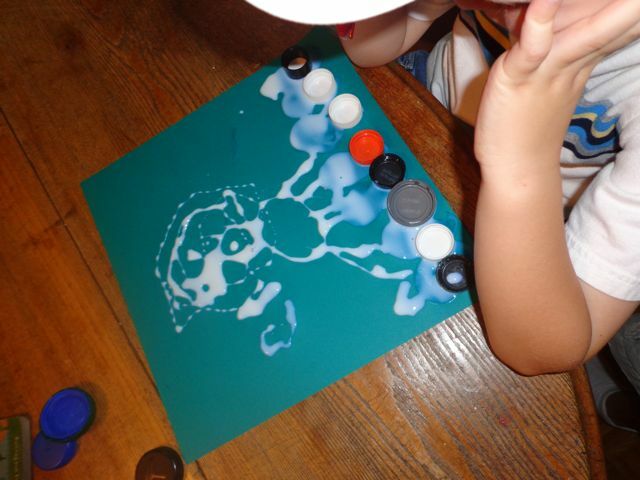 I told them that we were going to make an octopus. 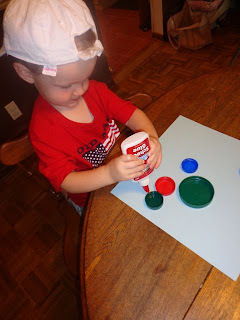 My oldest son knew right away that lids were for the "suction cups". However, I really didn't have a plan for the best way to accomplish making the octopus. 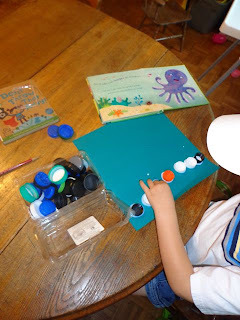 I gave them the choice by saying, "You can draw your octopus first or glue your lids first." They both chose to glue their lids. 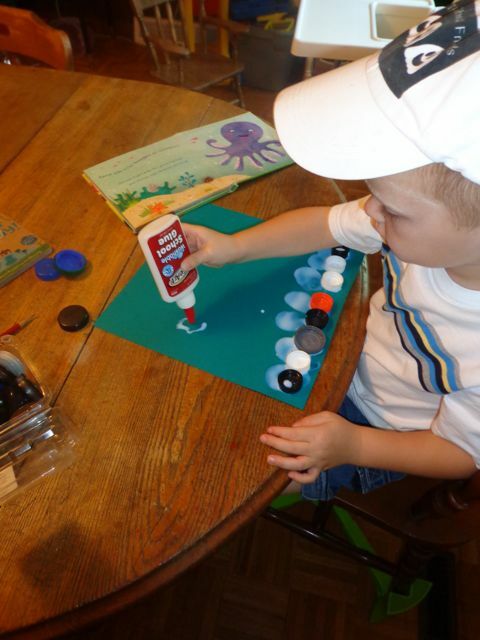 My two-year-old son chose to glue his lids in a random pattern. My four-year-old son chose to glue them across the bottom of his card stock paper. Then, he got the idea to use the glue to draw the octopus -- which I thought was a very cool idea. This was his second attempt and he was much more pleased. We even added buttons for eyes. 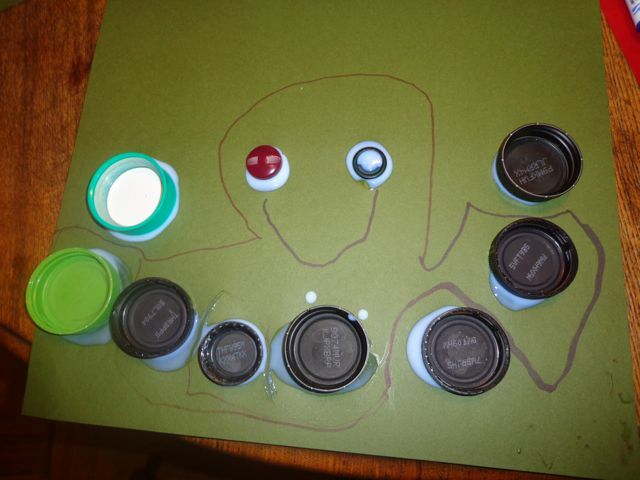 Lastly, I used a marker to draw around my youngest son's lids to form them into a swimming and smiling octopus. After completing the craft, I was pleased to discover that Betsy Snyder loves animals that live in water and if she wasn't a children's book author and illustrator she would love to be a marine biologist. When I was a kid, I would get to choose the kind of cake I wanted for my birthday party. I remember ice cream cakes with unicorns and rainbows, spice cakes with gooey fudgy frosting, and angel food cakes with strawberries on top (and thanks Mom, for avoiding birthday disaster by knowing I wanted "angel food cake" when I insisted it was called "angel fruit cake"). But there was one special dessert that I requested most of all, and I think it's still my favorite treat of all time. Grandma Lyon's lemon frost pie in chocolate shell (yes, it know that's not actually "cake", but it was MY birthday and I got to decide). Gram would always be sure to tell me how much work it was to make that pie -- how she had to separate the eggs, how she had to use the mixing bowl FOUR different times, and how she had to have a certain kind of chocolate at the just-right temperature to make the perfect curlicues for the topping. But she'd also always be sure to complain about all that work with a little wink and a smile, so I knew she didn't really mind, and I think she secretly loved making it for me (and for herself!). So today, while I still love that pie to pieces for all of its sweet-and-sour goodness, what I love even more is that it makes me think of my Gram with a wink and a smile. And that memory is the best birthday gift ever (yep, even better than lemon and chocolate). Combine cocoa and 2 T. sugar. Whip 1 c. heavy cream, fold into cocoa mixture. Add 1 T. lemon zest. Spread evenly in 9" or 10" pie pan (you might end up with some extra filling at the end with the smaller pan). Chill in freezer until firm. Beat egg whites until they form soft peaks. Gradually add 2/3 c. sugar and beat until glossy. Beat yolks until thick and lemon-colored and fold into egg whites. Whip remaining 1 c. heavy cream. Stir in lemon juice and zest. Fold cream into egg mixture and turn into frozen chocolate shell. Garnish with shaved chocolate (or garnish individual slices before serving if there is no room left in the pan). Freeze until firm. Set out at room temperature for a few minutes for easier slicing and serving. Betsy has offered the special treat of an autographed copy of her new book, Tons of Trucks by Sue Fliess and Betsy Snyder, to one lucky reader. Enter the contest using the Rafflecopter below. Remember to "Tweet for the Treat!" to increase your chances to win! Note: Eric from Happy Birthday Author will contact the winner to acquire their contact and inscription information which will be forwarded onto Betsy for autographing and shipment. Good Luck, tell all your friends that Betsy is now on Twitter (and would love some followers), and is giving away Tons of Trucks -- which my kids just loved! Betsy Snyder's next book will debut from Random House on December 26, 2012. You can pre-order your copy on Amazon.com today! My favorite birthday dessert is Texas Chocolate Cake with ice cream. Yummy! Betsy's books sound wonderful! and as always your activities look like tons of fun! I love that her career began with the invisible lady with one orange leg :) Happy Birthday, Betsy! And thanks for introducing me to her work, Eric! I love reading your fun activities you do with your kids! Thanks for introducing me to Betsy's books! Thanks for this introduction, Eric. Those octopi are just great and I know I would love the book, DON'T THROW THAT AWAY! DON'T THROW THAT AWAY sounds wonderful! We always have a stash of supplies tucked away for unexpected projects, too. The octopus art looks great and I will be trying that pie recipe. Delish! All her books sound great, and I loved the story of "Invisible Lady with One Orange Leg." I'm going to file away your DON'T THROW THAT AWAY activity for Earth Day. Thanks Eric! white cake with sugary icing!